Area: 1,267,000 sq. km (490,000 sq. mi. ); about three times the size of California. Cities: Capital: Niamey (pop. approx. 1.4 million). Other cities — Tahoua, Konni, Maradi, Zinder, Diffa, Dosso, Arlit, and Agadez. Terrain: About two-thirds desert and mountains, one-third savanna. Climate: Hot, dry, and dusty. Rainy season June-September. Nationality: Noun and adjective: Nigerien(s). Annual population growth rate (2010): 3.3%. Ethnic groups: Hausa 53%, Djerma (Zarma) 21%, Tuareg 11%, Fulani 7%, Beri Beri (Kanuri) 6%; Arab, Toubou, and Gourmantche 2%. Religions: Islam (97%); remainder traditional and Christian. Languages: French (official), Hausa, Djerma, Fulfulde, Kanuri, Tamachek, Toubou, Gourmantche, Arabic. Education: Years compulsory: 6. Attendance — 49% (male), 31% (female). Literacy (2008) — 29% (17% for women). Health: Infant mortality rate: 81/1,000. Life expectancy — 58 years. Constitution: Approved by national referendum October 31, 2010; enacted November 25, 2010. Branches: Executive: president (elected March 12, 2011; inaugurated April 7, 2011) and prime minister (appointed April 7, 2011). Legislative — National Assembly reinstated via legislative elections held January 31, 2011; sworn in March 30, 2011. Judicial — Constitutional Court, Supreme Court, Court of Appeals, High Court of Justice. Suffrage: The constitution provides for universal suffrage for Nigeriens age 18 or older. Administrative subdivisions: Eight regions subdivided into 36 districts (departments) and 266 communes (local councils, both urban and rural). Annual growth rate (2010): 7.5%. Per capita GDP (2010): $364. Avg. inflation rate (2010): 2.0%. Avg. inflation rate (April 2010 to May 2011): 2.1%. Natural resources: Uranium, gold, oil, coal, iron, tin, and phosphates. Agriculture (23.5% of GDP): Products: millet, sorghum, cowpeas, peanuts, cotton, onions, and rice. Industry (15.2% of GDP): Types: textiles, cement, soap, and beverages. Trade (2010): Exports (freight on board — f.o.b.) — $484 million. Types — uranium, livestock, gold, cowpeas, and onions. Major markets — France 41.9%, Japan 14.3%, United States 13.2%, Nigeria 7.8%. Imports (f.o.b.) — $1.62 billion. Types — consumer goods, petroleum, foodstuffs, transportation vehicles, machinery, bridge equipment, and industrial products. Major suppliers — China 44.9%, France 11.6%, United States 6.2%, U.K. 4.7%, Nigeria 3.9%, Japan 3.5%, Netherlands 3.4%. The largest ethnic groups in Niger are the Hausa, who also constitute the major ethnic group in northern Nigeria, and the Djerma-Songhai, who also are found in parts of Mali. Both groups, along with the Gourmantche, are sedentary farmers who live in the arable, southern tier of the country. Other Nigeriens are nomadic or semi-nomadic livestock-raising peoples — Fulani, Tuareg, Kanuri, Arabs, and Toubou. With rapidly growing populations and the consequent competition for meager natural resources, lifestyles of agriculturalists and livestock herders are increasingly threatened. Niger's high infant mortality rate is comparable to levels recorded in neighboring countries. However, the child mortality rate (deaths among children under age of 5) is particularly high (198 per 1,000 in 2010) due to generally poor health conditions and inadequate nutrition for most of the country's children. Niger's fertility rate (7.8 births per woman), is among the highest in the world, and is far higher than the sub-Saharan African average of 5.4. Two-thirds (66.7%) of the Nigerien population is under age 25. The primary school net enrollment rate is 49% for boys and 31% for girls. Additional education occurs through thousands of Koranic schools. Considerable evidence indicates that about 600,000 years ago, humans inhabited what has since become the desolate Sahara of northern Niger. Long before the arrival of French influence and control in the area, Niger was an important economic crossroads and the empires of Songhai, Mali, Gao, Kanem, and Bornu, as well as a number of Hausa states, claimed control over portions of the area. In the 19th century, contact with the West began when the first European explorers — notably Mungo Park (British) and Heinrich Barth (German) — explored the area searching for the mouth of the Niger River. Although French efforts at pacification began before 1900, dissident ethnic groups, especially the desert Tuareg, were not subdued until 1922, when Niger became a French colony. Niger's colonial history and development parallel that of other French West African territories. France administered its West African colonies through a governor-general in Dakar, Senegal, and governors in the individual territories, including Niger. In addition to conferring French citizenship on the inhabitants of the territories, the 1946 French constitution provided for decentralization of power and limited participation in political life for local advisory assemblies. A further revision in the organization of overseas territories occurred with the passage of the Overseas Reform Act (Loi Cadre) of July 23, 1956, followed by reorganization measures enacted by the French Parliament early in 1957. In addition to removing voting inequalities, these laws provided for creation of governmental organs, assuring individual territories a large measure of self-government. 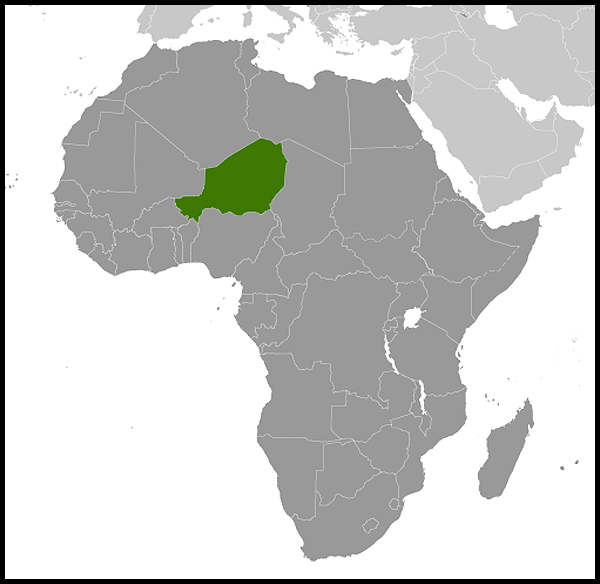 After the establishment of the Fifth French Republic on December 4, 1958, Niger became an autonomous state within the French Community. Following full independence on August 3, 1960, however, membership was allowed to lapse. For its first 14 years as an independent state, Niger was run by a single-party civilian regime under the presidency of Hamani Diori. In 1974, a combination of devastating drought and accusations of rampant corruption resulted in a military coup that overthrew the Diori regime. Lieutenant Colonel Seyni Kountche and a small group of military ruled the country until Kountche's death in 1987. He was succeeded by his chief of staff, Brigadier General Ali Saibou, who released political prisoners, liberalized some of Niger's laws and policies, and promulgated a new constitution. However, President Saibou's efforts to control political reforms failed in the face of union and student demands to institute a multi-party democratic system. The Saibou regime agreed to these demands by the end of 1990. New political parties and civic associations sprang up, and a national conference was convened in July 1991 to prepare the way for the adoption of a new constitution and the holding of free and fair elections. The debate was often contentious and accusatory, but under the leadership of Prof. Andre Salifou, the conference developed consensus on the modalities of a transition government. A transition government was installed in November 1991 to manage the affairs of state until the institutions of the Third Republic were put into place in April 1993 following the election of a ruling coalition. While the economy deteriorated over the course of the transition, certain accomplishments stand out, including the successful conduct of a constitutional referendum; the adoption of key legislation such as the electoral and rural codes; and the holding of several free, fair, and nonviolent nationwide elections. Freedom of the press flourished with the appearance of several new independent newspapers. In the culmination of an initiative started under the 1991 national conference, the government signed peace accords in April 1995 with all Tuareg and Toubou groups that had been in rebellion since 1990. These groups had claimed that they had lacked attention and resources from the central government. The government agreed to absorb some former rebels into the military and, with French assistance, to help others return to civilian life. Rivalries within the coalition elected in 1993 led to governmental paralysis, which provided Col. Ibrahim Bare Mainassara a rationale to overthrow the Third Republic and its President, Mahamane Ousmane, in January 1996. While leading a military authority that ran the government (Conseil de Salut National) during a 6-month transition period, Bare enlisted specialists to draft a new constitution for a Fourth Republic announced in May 1996. After dissolving the national electoral committee, Bare organized and won a flawed presidential election in July 1996 and his party won 90% of parliament seats in a flawed legislative election in November 1996. When his efforts to justify his coup and subsequent questionable elections failed to convince donors to restore multilateral and bilateral economic assistance, a desperate Bare ignored an international embargo against Libya and sought Libyan funds to aid Niger's economy. In repeated violations of basic civil liberties by the regime, opposition leaders were imprisoned; journalists often arrested, beaten, and deported by an unofficial militia composed of police and military; and independent media offices were looted and burned with impunity. In April 1999, Bare was overthrown and assassinated in a coup led by Maj. Daouda Mallam Wanke, who established the transitional National Reconciliation Council to oversee the drafting of a constitution for a Fifth Republic with a French-style semi-presidential system. In elections that international observers found to be generally free and fair, the Nigerien electorate approved the new constitution in July 1999 and held legislative and presidential elections in October and November 1999. Mamadou Tandja won the presidency, heading a coalition of the National Movement for the Development of Society (MNSD) and the Democratic and Social Convention (CDS). In July 2004, Niger held nationwide municipal elections as part of its decentralization process. Some 3,700 people were elected to new local governmental positions in 265 newly established communes. Although the ruling MNSD party won more positions than any other political party, opposition parties made significant gains. 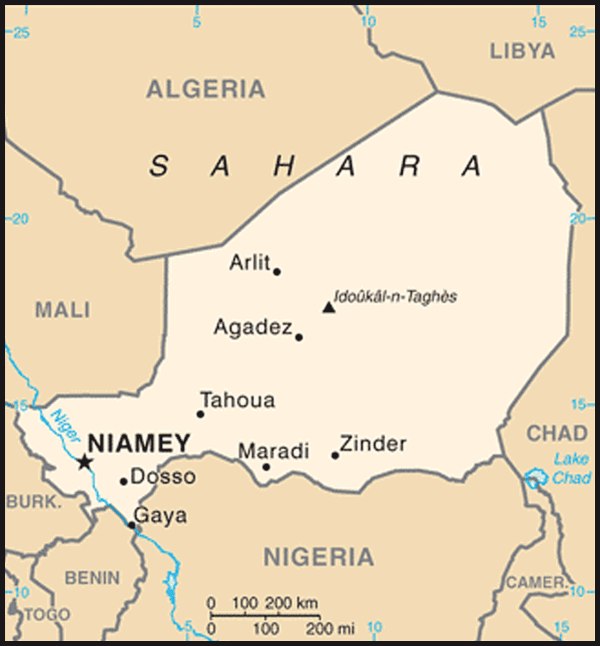 In November and December 2004, Niger held presidential and legislative elections. Mamadou Tandja was elected to his second 5-year presidential term with 65% of the vote in an election that international observers called generally free and fair. This was the first presidential election with a democratically elected incumbent and was a test of Niger's young democracy. In the 2004 legislative elections, the ruling MNSD, the CDS, the Rally for Social Democracy (RSD), the Rally for Democracy and Progress (RDP), the Nigerien Alliance for Democracy and Progress (ANDP), and the Social Party for Nigerien Democracy (PSDN) coalition, all of which backed Tandja, won 88 of the 113 seats in the National Assembly. In February 2007, a previously unknown rebel group, the Movement of Nigeriens for Justice (MNJ), emerged as a formidable threat to peace in the north of Niger. The predominantly Tuareg group issued a number of demands, mainly related to development in the north. It attacked military and other facilities and laid landmines in the north. The resulting insecurity devastated Niger's tourist industry and deterred investment in mining and oil. The government labeled the MNJ members criminals and traffickers, and refused to negotiate with the group until it disarmed. Since then, the Government of Niger, with U.S. encouragement that included a conflict-negotiation workshop facilitated by the U.S. Institute of Peace, pursued several rounds of peace talks with the MNJ and other rebel groups, resulting in a de facto ceasefire, weapons handovers, and an executive order providing amnesty to rebels and those who supported them, including members of the Nigerien Armed Forces. The Government of Niger has made considerable progress in bringing peace and stability to the region; following the November 2009 lifting of the state of alert for Agadez Region, tourists were able to travel to and within the urban parts of Agadez city. President Tandja, who should have left office in December 2009 after having served two consecutive 5-year terms, manipulated political events to prolong his rule. To do so, in 2009 he mounted a campaign to replace the 1999 constitution, which he could not amend, with one that would eliminate term limits and consolidate presidential authority, a clear violation of the 1999 constitution. 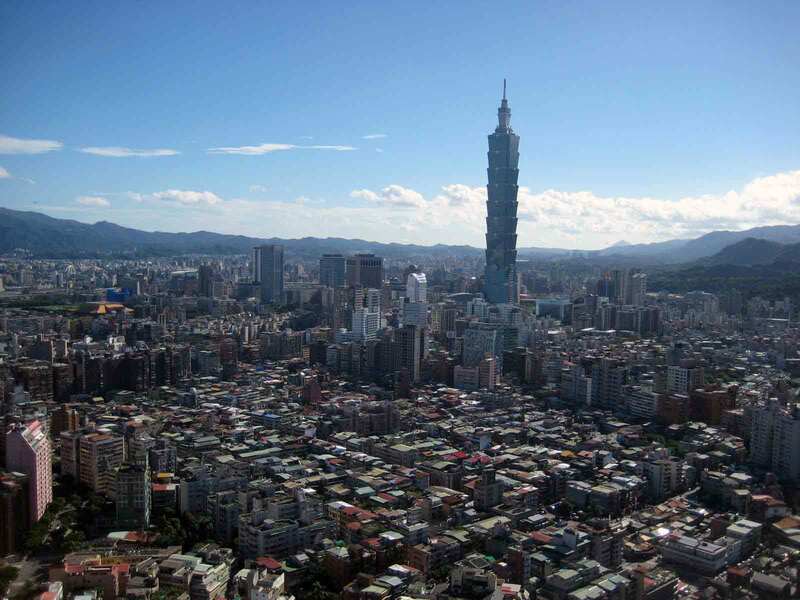 Overriding the formal ruling of the Constitutional Court and the views of pro-democracy civil society and political parties, Tandja forced through a costly referendum and instituted the Sixth Republic. An Economic Community of West African States (ECOWAS) mediator sent to help bring an end to the political crisis was unable to break the impasse. On February 18, 2010, military forces stormed the presidential compound and took members of the president's senior staff and ministers into custody. There were few casualties, and by that evening leaders of the military junta who led the coup against Tandja announced on Niger's public television station that the government would be led by a new entity called the Supreme Council for the Restoration of Democracy (CSRD). In April, the president of the CSRD and leader of the coup, Major Salou Djibo, chaired a national ceremony for the installation of the National Consultative Council (NCC), charged with providing guidance on all questions of national interest and producing versions of the "fundamental documents," notably a draft constitution, a draft electoral code, a draft political parties' charter, draft statutes for the opposition, and a draft law on public access to information. On May 6, 2010 the CSRD accepted the NCC's proposal for a 12-month transition to democracy, retroactive to February 18, 2010. On September 2, 2010, CSRD president Djibo approved the draft constitution submitted by the NCC; on October 1, he signed a decree calling for a constitutional referendum on October 31. The referendum passed with over 90% approval. Local elections were held on January 11, 2011, and first-round presidential elections in conjunction with parliamentary elections on January 31. The second-round presidential elections pitted Mahamadou Issoufou of the Nigerien Party for Democracy and Socialism (PNDS) against Seini Oumarou of the MNSD. On March 12, Issoufou won the presidency with about 58% of the vote. He was inaugurated on April 7, 2011 and named Brigi Rafini as Prime Minister. Niger's independent judicial system is composed of four higher courts — the Court of Appeals, the Supreme Court, the High Court of Justice, and the Constitutional Court. In January 2007, the National Assembly voted to divide the Supreme Court into three high courts — an Administrative Court, a Supreme Court of Justice, and an Audit Court. The chief administrators in each of Niger's eight regions (governors) and 36 districts or departments (prefects) are appointed by the Government of Niger and function primarily as the local agents of the central authorities. Niger's embassy in the United States is at 2204 R Street, NW, Washington, DC 20008 (tel. 202-483-4224/25/26/27), and its permanent mission to the United Nations is at 417 East 50th Street, New York, NY 10022 (tel. 212-421-3260). Niger is one of the world's top uranium exporters, but 80% of the population is employed in subsistence agriculture. The country has consistently ranked at the bottom of the UN Human Development Index, rising from the bottom of the index in 2009 to number 167 of 169 countries in 2010. Traditional subsistence farming, herding, small trading, seasonal migration, and informal markets dominate an economy that generates few formal sector jobs. Fourteen percent of Niger's GDP is generated by livestock production — camels, goats, sheep, and cattle. Fifteen percent of Niger's land is arable, found mainly along its southern border with Nigeria. Rainfall varies, and when insufficient, Niger has difficulty feeding its population and must rely on grain purchases and food aid to meet food requirements. Niger's economic growth rates are closely linked to rainfall and fluctuate widely in connection with agricultural output. In 2010, the economy showed strong growth (8% growth rate in real GDP, up from -1.2% in the drought year of 2009). In 2009, 64% of export earnings were from uranium, 20.5% were from livestock, and about 6% from other agriculture, most notably onions. Actual livestock exports far exceed official statistics, which often do not include large herds of animals that are simply walked across the border to markets in Nigeria. Some hides and skins are exported, and some are used for handicrafts. Niger has exploitable deposits of gold in the region between the Niger River and the border with Burkina Faso. Niger's sole commercial gold mine, Samira Hill, opened in 2004 under a joint venture known as SML between a Canadian company — Societe SEMAFO Inc. (80%) and the Government of Niger (20%). Gold prices have been very strong in recent years, but income from the Samira mine was limited until April 2009, because a percentage of the mine's production had been committed to forward sales at a lower price when the mine was initially financed. Now that this commitment has been fulfilled, Samira's production is sold at market price, and SML was recently awarded an additional concession that will extend the life of the mine. Niger also has oil potential. China National Petroleum Company is exploiting the Agadem block and a refinery north of Zinder, which was expected to be operational by late July 2011. The parastatal SONICHAR (Societe Nigerienne de Charbon) in Tchirozerine (north of Agadez) extracts coal from an open pit and fuels an electricity-generating plant that supplies energy to the uranium mines. There are additional low-quality coal deposits southwest of the current mines. Substantial deposits of phosphates, iron, limestone, and gypsum also have been found in Niger. The new government actively seeks foreign private investment and considers it key to restoring economic growth and development. With the assistance of the United Nations Development Program (UNDP) and international financial institutions, it plans a concerted effort to revitalize the private sector. Niger has attracted significant investment over the years, in uranium, the petroleum sector, cellular communications, and, most recently, in a dam and a cement factory, but poor legal and physical infrastructure still hamper investment. To date, there are seven major active Internet service providers operating in Niger — Sonitel, Afripa, Moov Niger, Orange Niger, ConnecteO, X.com, and Liptinfor. They are fairly independent and they are not required to use the state-owned infrastructure. Sonitel no longer has a monopoly in the telecommunications sector. In December 2000, Niger qualified for enhanced debt relief under the International Monetary Fund (IMF) program for Heavily Indebted Poor Countries (HIPC) and concluded an agreement with the Fund on a Poverty Reduction and Growth Facility (PRGF). Niger reached decision point in January 2001 and completion point in 2004. Debt service as a percentage of government revenue was slashed from nearly 44% in 1999 to 10.9% in 2003 and will average 4.3% during 2010-2019. The debt relief cut debt service as a percentage of export revenue from more than 23% to 8.4% in 2003, and decreases it to about 5% in later years. 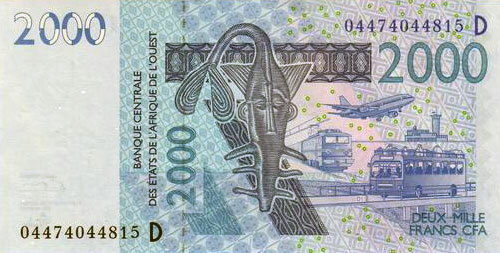 In 2005, the IMF canceled all Niger's debt to it (approximately $111 million) incurred before January 2005. In 2006, the African Development Fund canceled $193 million in debt for Niger. The World Bank announced that approximately $745 million in debt relief for Niger would be phased in over the next 37 years. The most important donors in Niger are France, the European Union, the World Bank, the IMF, and UN agencies — UNDP, UNICEF, FAO, WFP, and UNFPA. Other donors include the United States, Belgium, Germany, Switzerland, Japan, China, Italy, Libya, Egypt, Morocco, Iran, Denmark, Canada, and Saudi Arabia. The U.S. Agency for International Development (USAID) has a field office that operates within the U.S. Embassy in Niamey. The United States has provided approximately $65 million to Niger's development during FY 2011 (including $15 million in non-emergency P.L. 480 food assistance; $18 million in emergency food programs; and $32 million in agriculture, nutrition, community health, peace and security, election support, and democracy and governance). These development and emergency programs are carried out by more than 20 U.S. implementing partners (private voluntary organizations and contractors); a limited amount of this support is made available to UN agencies such as WFP and UNICEF. Since inauguration of the elected government in April 2011, the United States, with the majority of the donor community, has started to reengage in several key sectors. Foreign aid represents 8.3% of Niger's GDP and over 40% of government revenues. The Nigerien Armed Forces total approximately 15,000 personnel with some 5,000 gendarmes, 400 Air Force personnel, and 10,000 Army personnel. Air Force equipment includes two Mi-35s, two Mi-17s, two DA-42 reconnaissance aircraft, one C-130, one Dornier 228, one Boeing 737 presidential aircraft, and a small fleet of ultra-light aircraft. Specialized Army assets include Chinese-made and French-made light armored vehicles, some artillery pieces, and an array of crew-served weapons (machine guns, recoilless rifles, and mortars). The Nigerien Armed Forces are divided into eight battalions and five defensive zones partitioned roughly corresponding to Niger's administrative regions. Niger possesses limited but adequate training facilities for soldiers, non-commissioned officers, and basic officer training but relies on external support for advanced and technical training. Nigerien troops are most often deployed using two to three light pickup trucks carrying seven to ten soldiers with assault rifles and a mounted crew-served machine gun. Niger's primary military missions include guaranteeing national sovereignty by protecting its national interests against aggression; participating with, and reinforcing, police in civil defense matters; countering the proliferation of small arms; contributing to regional security; and supporting international peacekeeping operations. While Nigerien forces have expressed a desire to actively combat terrorism and secure their borders, resources are stretched thin protecting mining and petroleum investments, participating in international peacekeeping operations, and dealing with residual banditry. Primary partners for security cooperation include France, China, Algeria, and Morocco. Historically strong cooperation with the United States has recently been complicated by coup d'etats and allegations of human rights abuses, but resumed in the summer of 2011. In spite of their limitations, Nigerien Armed Forces are relatively professional, capable, and have the political support necessary to carry out appropriate security operations within their borders. Niger pursues a moderate foreign policy and maintains friendly relations with the West and the Islamic world, as well as nonaligned countries. It is a member of the United Nations and its main specialized agencies, and in 1980-81 served on the Security Council. Niger maintains a special relationship with France and enjoys close relations with its West African neighbors. Niger is once again a member in good standing of ECOWAS (Economic Community of West African States) and the African Union after having been suspended from late 2009 until the completion of the 2011 elections. It is a charter member of the African Union and the West African Monetary Union, and also belongs to the Niger River and Lake Chad Basin Commissions, the Nonaligned Movement, and the Organization of Islamic Cooperation. In 2010, Niger was elected to the Board of Governors of the International Atomic Energy Agency and the International Telecommunications Union. U.S. relations with Niger since its independence have generally been close and friendly, but President Tandja's undemocratic actions in 2009 put a strain on bilateral relations. As a consequence, the United States stopped all non-humanitarian projects in Niger in December 2009, and the ban on most bilateral assistance remained in place until after the transition back to democratic government. It is estimated that the United States provided nearly $50 million dollars in official aid for 2009 prior to the suspension, with the funds administered through American and local non-governmental organizations for food security, health, and communication/media outreach programs. The Peace Corps arrived in Niger in 1962 and continued without interruption until January 2011, when the program was suspended due to concerns over volunteers' safety stemming from a kidnapping in Niamey by al Qaida in the Islamic Maghreb (AQIM). The U.S. Embassy (http://niamey.usembassy.gov/) in Niger is located on the Avenue des Ambassades. The embassy telephone numbers are (227) 20-72-26-61/62/63/64/65, and the fax number is (227) 20-73-31-67. The mailing address is B.P. 11201, Niamey, Niger.